Traditionally, chest tube placement has occurred as a blind technique, as such having inherent possibility for error. 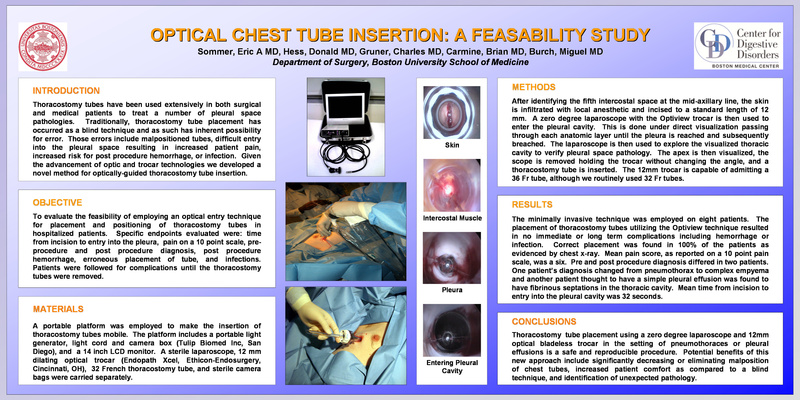 Given the advancement of optics and the evolution of trocar technologies we have developed a novel method for optically guided chest tube insertion. Using a standard 12mm dilating optical trocar and 0 degree 10mm lens we place chest tubes under direct optical guidance through the chest wall, perform brief thoracoscopy and guide our chest tubes into appropriate position. We evaluated in this, our pilot study, several outcome measures in 4 patients in whom this technique was used. Time for entry was measured from incision to entry into pleura, Pain on a 10 point scale, Pre operative versus post operative diagnosis and complications such as bleeding, erroneaous placement or infection. All four patients had no complications, pain was a 6 on average and there was no difference in preoperative versus post operative diagnosis, Average time to entry was 8 seconds. We conclude in this Pilot study, that optical chest tube placement is a safe and reproducible procedure. Potential benefits include decreasing malposition of chest tubes and allowing for further evaluation of unexpected pathology.